October had cast the 18th Infantry in the role of enveloping Aachen from the east by the seizure of Verlautenheide, Crucifix Hill, and Ravelsberg Hill. This bold move had served to accomplish two things, namely; the reduction of the secondary line of defenses of the Siegfried line in the Division sector and the sealing of the fate of a few thousand Germans in the first great German city to fall into American hands. November saw the Regiment fight one of its most bloody and extended battles of the various campaigns overseas. Thrusting forward as an integral part of the greatest offensive ever waged on the Western Front the 18th Infantry made a continuous two-mile assault through wooded stretches and villages that were literally drenched with artillery and mortar fire, to overcome the fiercest type of ground fighting ever encountered by our troops. The terrain and weather made conditions almost unbearable for our men at times and only sheer guts and determination carried us through to our objective. Hand-to-hand conflict was commonplace in this type of warfare in which there was little opportunity to maneuver. Casualties were extremely heavy — over one thousand (1,000) in two weeks time. It was the first time that replacements had to be employed hurriedly to bolster the waning numbers of the line companies. However the enemy paid even more heavily for his war of attrition in spite of the fact that he fought on ground of his am choosing in well prepared positions with a maximum of support from artillery and self-propelled guns. Seven hundred and twenty-two (722) prisoners, comprising elements of the 1st Storm Regiment, 3rd Panzer Grenadier Division, 12th Infantry Division, 47th Volksgrenadier Division, and 3rd Paratroop Division were processed through the Regimental prisoner of war cage. 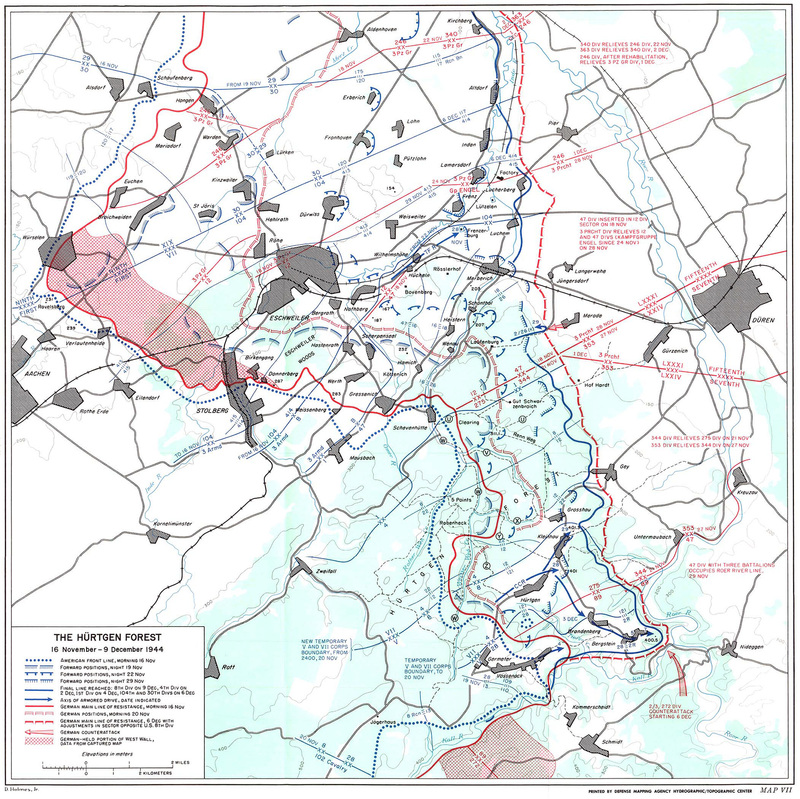 The month of November opened with the 18th Infantry in a strong defensive position on the low rolling ridge line which formed the eastern perimeter of the Aachen defenses. These positions had been occupied for more than three weeks while plans were being carefully prepared in higher headquarters for a further use of the Regiment, and the 1st U. S., Infantry Division, in a role which would culminate in the enemy being driven closer to the heart of its homeland. During this period of waiting active patrolling was constantly carried out so as not to give the enemy a moments rest. Replacements were filtered into the ranks of the war-hardened veterans and battalions were rotated so that every six (6) days one battalion would be afforded three (3) days of rest and reorganization. Finally on the 8th of November, the, Division was relieved by the 104th U.S. Infantry Division, the 18th Infantry by the 413th Infantry Regiment. The Division was then moved to an assembly area in the vicinity of Zweifall, Germany, to prepare for the "big push". In this area limited training facilities were utilized and a general reorganization took place. Replacements were received and the men were bathed and reequipped. Limited recreation facilities were afforded the men in the way of movies and twenty-four (24) hour passes to the Division Rest Center in the vicinity of Herve, Belgium. During this time however, the Regimental and Battalion Staffs were kept busy on the plans for the future operation. The role that the 1st U.S. Infantry Division was to play in the forthcoming offensive was great, and depended upon perfect coordination and timing. The plan called for the seizure of jump-off points for securing bridgeheads across the Roer River, with the 26th, the 16th and the 47th Combat Teams leading off in the attack. 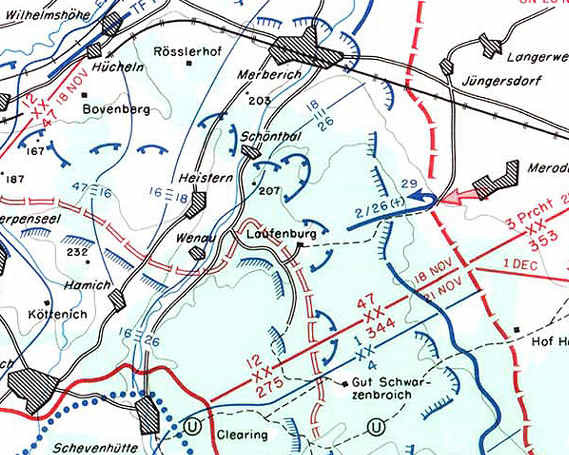 After the attack had reached the northern edge of the woods over looking the Cologne plains, the 18th Infantry was to spring forward and seize the villages of Luchem and Lucherberg, after which time the 16th lnfantry and the 26th Infantry would resume the attack to the Division objectives, prior to H-Hour two thousand (2,000) bombers of the 8th U.S. Air Force were to pound the enemy front line and rear installations for one and one-half hours. The stage was set and November 16th was announced as D-Day. On the 17th November, the 3rd Battalion, 18th Infantry was moved to an assembly area between Vicht and Schevenhütte and attached to the 16th Infantry for operations. Company "L" was utilized to occupy part of the line contained by the 16th lnfantry. On the 18th of November, at 1400 hours, the battalion, less Comparer "L", was committed in an attack on Wenau, a small river valley village on the right flank of the 16th lnfantry. The fighting was costly and the progress slow. Thick woods had to be traversed and the movement was greatly hampered by enemy artillery and mortar fire. Nevertheless the battalion pushed on, and on the 20th of November the village was taken. Orders were then received by the Battalion Commander to advance to the northeast and attack and secure Heistern, after which, the 1st Battalion would pass through the 3rd Battalion and continue the attack to the all-important Hill Feature 203. The little village of Heistern was situated on a high piece of terrain that fully commanded that part of the Division sector through which the 16th Infantry was to launch its attack, and only through its capture could that part of the Division plan be carried out. It was known that the village was strongly held and a bitter fight was in the offing, but the battalion advanced with determination, and by dark, the southern half of the village was occupied by "I" and "K" Companies. The advance had been greatly hampered by intense enemy artillery and mortar fire and street fighting was still in progress when darkness came. At 0335 hours, on the morning of the 21st of November, the enemy launched an aggressive counter-attack against both "I" and "K" Companies to regain his lost ground, but the attack was successfully repulsed with the enemy suffering heavy casualties. At 0830 hours, on the same morning, the battalion resumed its attack and by mid-afternoon the town was completely cleared of the enemy, and a key terrain feature, standing in the way of the success of the Division plan, had fallen. It was then that the 1st Battalion could push forward and secure the ground that would permit the 16th Infantry to fulfill its mission. 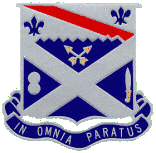 On the 20th of November, the 2nd Battalion, 18th Infantry was committed on the right of the 3rd Battalion, with the mission of crossing the Wehe River at Wenau and attacking north to Langerwehe. The crossing was successful but the advance from the east bank of the river was greatly hampered by enemy artillery. Again, a high wooded hill, Number 207, stood in the way of the battalion's advance and had to be seized, it was known that the hill was well fortified, and to complete this mission a plan had to be devised to contain swiftness of movement and maneuver, with a minimum of casualties. This was difficult due to the type of terrain the Regiment was fighting over --- heavily wooded, and creased by deep draws that were constantly interdicted by enemy fire. Two attempts were made on the 21st and 22nd to storm the hill, but were unsuccessful. The enemy had full support of its artillery and the fire was so intense that movement forward was impossible. However on the 23rd of November, the hill was seized and the battalion pushed on, but not without heavy casualties. The 1st Battalion was committed on November 21st. Their mission was to pass through the 3rd Battalion, now in Heistern, and advance toward Langerwehe, at the same time, securing a strip of woods, which lay to the northeast of Heistern, through which the 16th Infantry was to launch an attack to the north. The battalion jumped off at the prescribed hour but was subjected to heavy concentrations of enemy mortar and artillery fire, and progress was slow. Thick woods, again, was the obstacle and severe casualties were suffered from tree bursts. This battalion, too, had a well fortified hill in its path that had to be seized before its final objective could be reached. Finally, on November 27th, after six (6) days of severe fighting, the hill was seized and the battalion pushed on to its objective. On November 28th the Regiment finally had accomplished its mission, Langerwehe was taken. There ensued a brief period of street fighting from which many prisoners were taken. The town was cleared and positions were then consolidated around the town and further orders awaited. Thus ended a month in the fighting annuals of the 18th Infantry that had no equal as far as intensity of fighting, physical hardships and heavy going was concerned. Yet, they were poised and ready for any further mission assigned them.